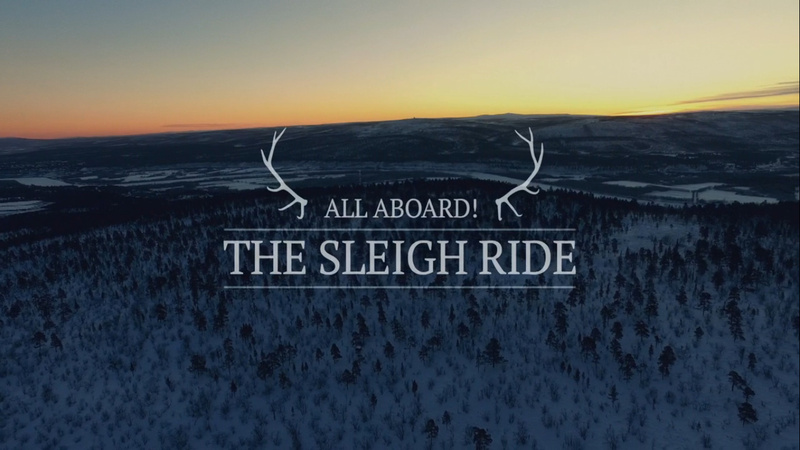 The Slow TV Blog: Could the BBC's Sleigh Ride Slow TV have been even better? Could the BBC's Sleigh Ride Slow TV have been even better? The long awaited Sleigh Ride on BBC4 has been and gone. With the precedent of All Aboard! The Canal Trip earlier this year I was hopeful for more of the same. Since becoming aware of it several months ago I'd eagerly awaited this next exploration of the BBC into Slow TV. It's an important format, able to be many things at the same time to many people and I'm eager to see it be taken up in its optimum form by broadcasters outside of Norway. If I appear to be having a moan, it’s not just for the sake of it. I did enjoy the The Sleigh Ride but I know Slow TV can be a lot more as a production and do a lot more for the audience. Hopefully I'm being constructive! I feel The Sleigh Ride gripped the potential of what Slow TV could be for the BBC even less than The Canal Trip. It seems from following comments on social media that many who had no issues with The Sleigh Ride are relatively new to watching Slow TV. My concern is that unfamiliarity with what Slow TV can be, for many, will make easier acceptance of lower production values, not so good a framing of the concept of slowness in Slow TV, and the consequent relation of the subject being shown to the viewer. Although it was good, it was neither enough of an ambient TV experience nor a TV event. Slow TV is orientated around the experience of viewing, not a flow of (re)articulated information. Slow TV is not about digesting a stream of information, facts and figures. I felt The Sleigh Ride was on the verge of conforming to a traditional documentary mode with so many wayside facts and figures. Yes, some information which sets the context of the subject, establishes parameters of the activity, but not so much that it distracts from the journey related by the camera. When the embedded text appeared, our attention was diverted to it (especially when appearing in the distance) and the imperative rush to ingest the fact before it disappears. Let the experience be the primary source of information, especially in a Slow TV production where it is the image that is the medium of the experience, not the words said or written. The subject of a Slow TV broadcast gains a sense of wholeness when the entire expanse of time which that subject requires is accommodated. Not an arbitrary section which neatly fills limited TV schedules. The implicit message of Slow TV, is that it is something extraordinarily ordinary, and that message hits home when the TV schedules are forced to accommodate it. Think what happens to the schedules when a major sports, national event or news event is happening. It barges into the schedule. "Oi! I'm important and you're going to watch me!". Slow TV needs its subject not be trimmed and not edited into so it conforms to a time conscious medium. Why was the journey picked up at the point we began? Why did it end where it left off? It felt like an arbitrary section of the journey which would fill the schedule. Instead of showing us the passage of A through to Z, it gave us E through to H. I watched The Sleigh Ride with three others, all of us left wondering where the sledge was actually going and why we were left where we were. A map was shown at the hour point illustrating the entire route but not the section of the journey concerned. As my father in law commented, “We watched that for nearly two hours and didn’t know where they were going or why they were going there”. Slow TV needs to make the viewer ask questions of what might happen and not leave the big questions unanswered. It needs to facilitate a mental questioning, such as what the animals might do next? what could be appearing around the next corner? Small things which engage our curiosity, akin to ‘people-watching’ at train stations and airports which make us ponder the minutiae of the narratives we see. When I visit a coffee shop, I usually prefer a window seat so I can glance up and ponder the many small stories happening outside. 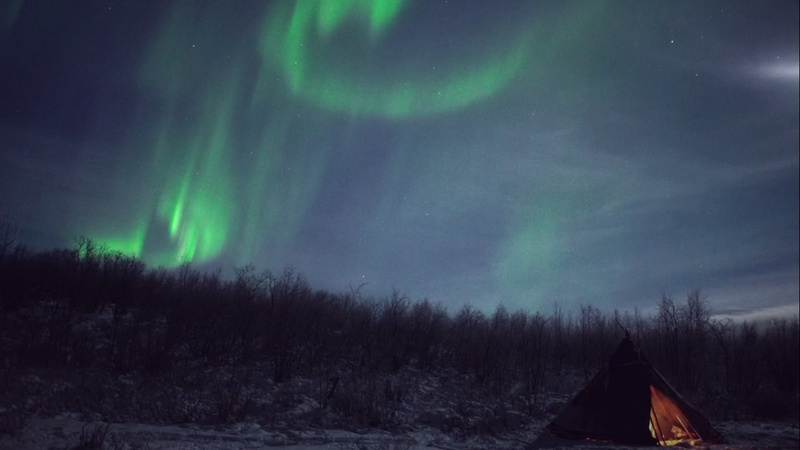 This kind of wondering is quite absorbing, and for The Sleigh Ride it was when the reindeer was digging for food around 1 hour 15 minutes in the broadcast and the aurora borealis for a couple minutes at the end. Both moments allowed undirected and unmanufactured events to enable the viewer to ponder the tiny nuances of the stories being shown. More moments like these will further immerse a viewer in the film and give, in some senses, a self-populating content in this documentary format. 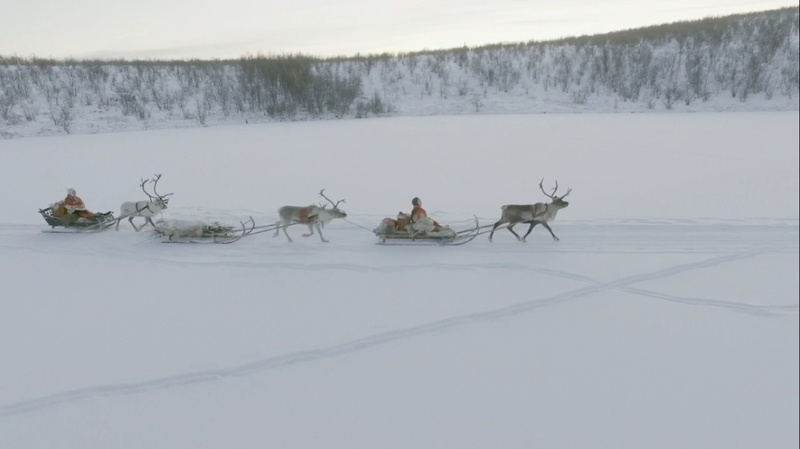 So, in terms of The Sleigh Ride, we never knew the purpose of the Sami women's journey at the time of filming. Yes, it was an old postal route but were they delivering or collecting parcels and post on their journey? We're not told. They had logs on their sleighs, but what else? The subject is best served by being an activity or journey which would happen anyway, whether or not the cameras were there. Not a specially crafted reconstruction. 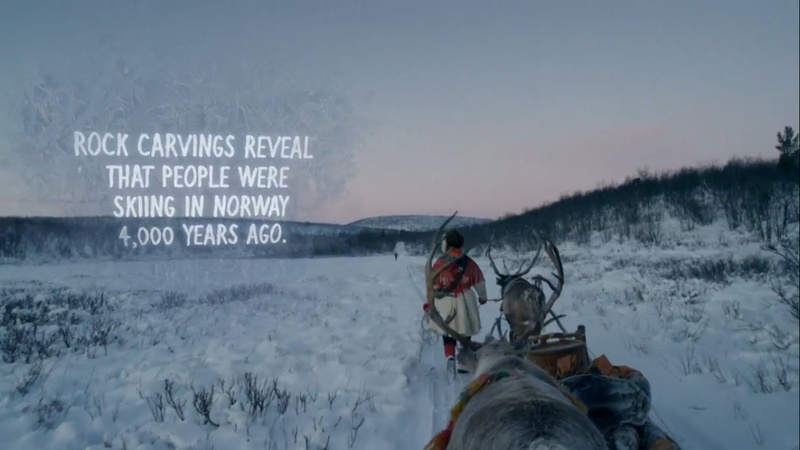 The producers of Norwegian Slow TV in the NRK Hordaland region have referred to the format as being 'reality revealed' - the closest thing to a fly on the wall documentary. It's not reality reconstructed. It's what is actually going on which the camera is there to capture. When it’s a Slow TV about nature or a journey it should be one which happens anyway; film that, let us know the reason why it happens, and let the camera reveal what would happen if the camera were not there, insofar as possible. SLOW TV: NOVELTY STOCKING FILLER OR MAIN PRESENT? So, while it was a welcome Christmas broadcast, it felt like it could have been more. It felt more like a novelty stocking filler. Very good and engaging in its own right, but not hugely memorable and not noticed by as many as it could be. The ratings for The Sleigh Ride didn't match that of The Canal Trip and didn't break out of BBC4's usual market share. Slow TV can be a novelty stocking filler but for the short time given for this Slow TV it was trying to be more than a stocking filler. When you know Slow TV can also be the amazing main present hidden behind the sofa for maximum surprise and which will be seen and talked about by many many more and remembered for a long time, The Sleigh Ride felt like a falling short of the potential of the format. It was too busy with information to thoroughly sink into the ambient aspect of it - or the broadcast should have been considerably longer with the information shown on the screen for a few more seconds. Slow TV can be many things from the personal ambient TV trip to a national event celebrating a journey or activity. If you’re not familiar with Slow TV, don’t think it’s just a two camera stocking filler - it can be much more than that. It can be the big present which will thrill and delight most of those who experience it. So, yes please, BBC, let’s have more Slow TV - longer, less information, more opportunity to experience what you’re showing us. If you want to experience All Aboard! The Sleigh Ride, it's on the BBC iPlayer until 25th January 2016, right here. Subsequent repeats will likely put it back on iPlayer in the future. Geoblocking of content may well apply outside of the UK. What was so right with Russia's War and Peace Slow TV - война и мир?